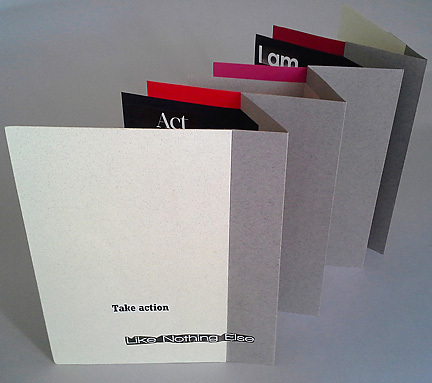 Last summer I had the opportunity to do a collaborative book project with students aged 5-10. We called it “The Big Book“. 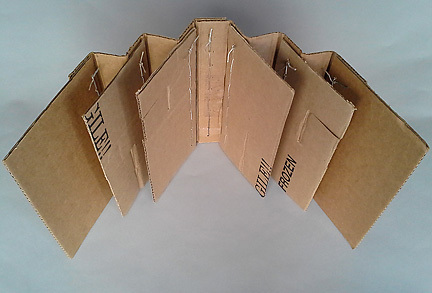 I created the structure out of repurposed corrugated cardboard. The students then added to, developed, embellished and played with the structure. 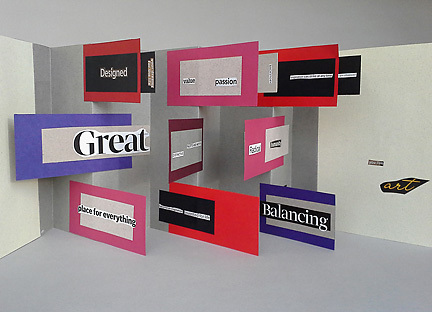 The students had access to all of the drawing, painting and collage materials we were using in class on our bookmaking projects to use in any way they wished (within time and space constraints, and reason) on the The Big Book. Here is some of their play….. I primed all of the surfaces, and painted the outside of the covers and spine black and the inside white. 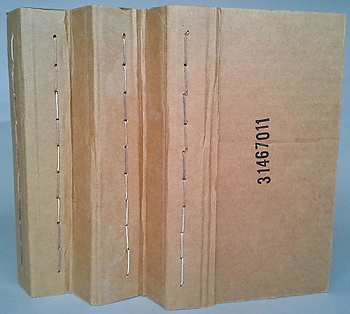 I framed the outside of the covers with extra strips of cardboard for stability. 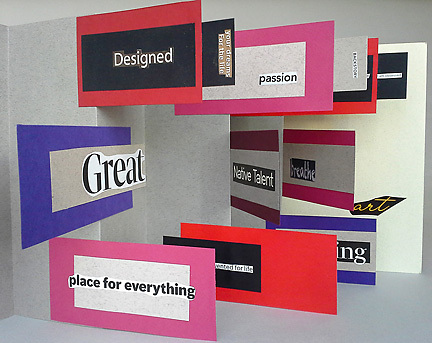 to create designs, borders, text, textures, color and artworks on the collaborative piece. which melded together to become a singular Book Work of charm, energy, and personality! We worked together. We created together. We laughed together. We respected each other. 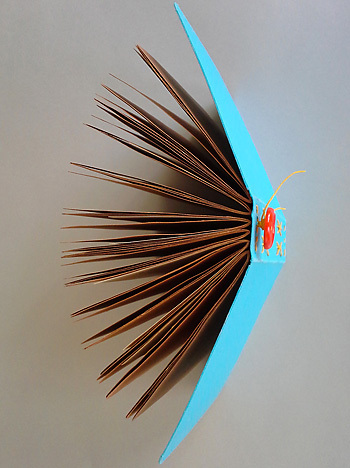 Last summer I had the opportunity to do a collaborative book project with students aged 5-10….we called it “The Big Book“. 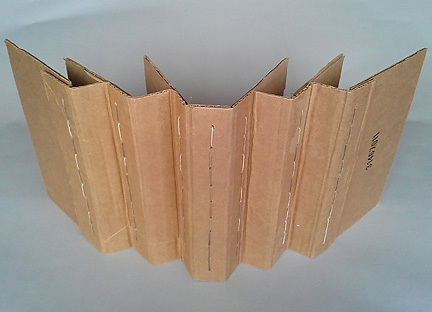 I constructed a “folded fan” style flag book…out of corrugated cardboard. 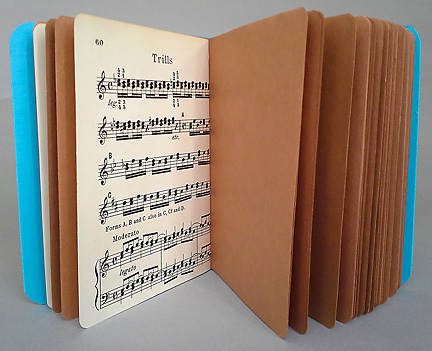 I folded an accordion spine, attached a front and a back cover, and two pages inside, going in the same direction, which fanned out when the book was opened. Back cover of “The Big Book“. I used tacky glue to put the pieces together, then sewed therm in place with hemp cord, and finally, trimmed the whole piece off with patterned duck tape. I then primed all of the surfaces, and painted the outside (front and back covers and spine) black, and the inside white, with acrylics. 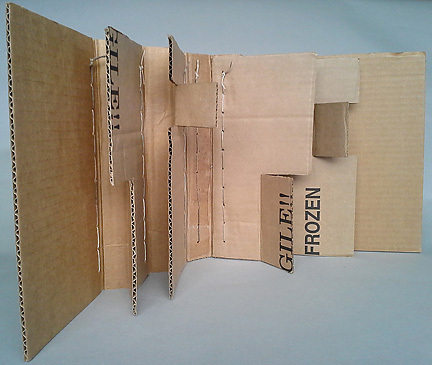 I added extra strips of re-purposed corrugated cardboard for stability. 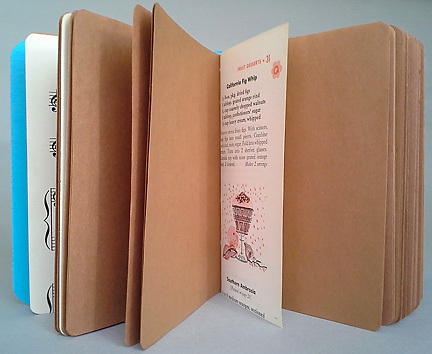 Students embellished the cardboard borders which also added structural support to the book. A student’s expression of gratitude! So happy to see this…. 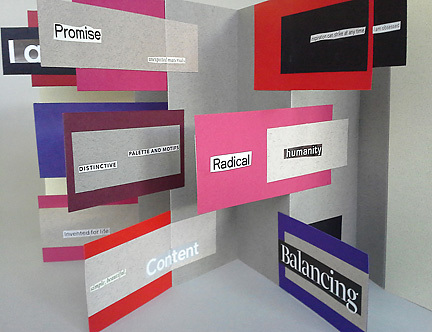 Students embellished just about every inch of the book…playing with words, colors, textures, designs and materials. I created the structure…but the young artists left their mark/s….and made the piece come alive. Much fun was had in the process. Students learned not only about using materials on a scale larger than their other book projects, but also about working together, collaboration, communication and cooperation. Skills needed now perhaps more than ever. Good lessons for our times. For any times. For all the times of our lives. 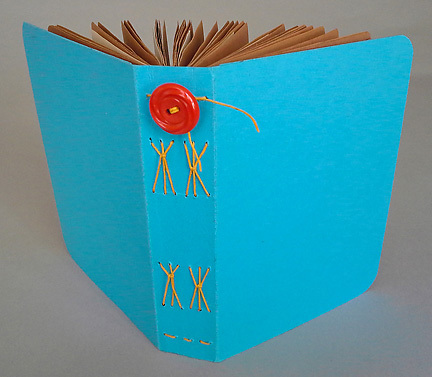 Long stitch multi-signature book…with button…learned from the great Jeannine Stein. Signatures are gatherings of folded pages that nest inside each other. Here you can see the six signatures clearly! and upside-down maps provide moments of surprise and pause. 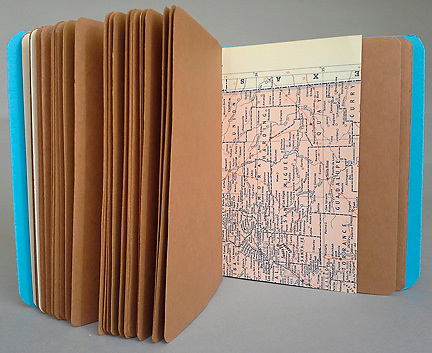 Flag Book with Found Writing, designed as an inspirational sample for teen students. The movement of the book makes malleable meaning of its words. to underline the meaning…or create new meaning. 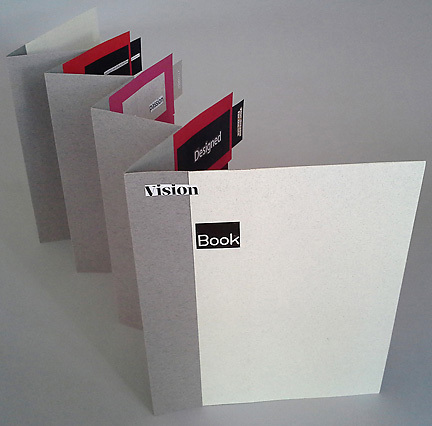 “Double Fan Book”, a model for a life-sized “Big Book” that could be used as an presentation space. 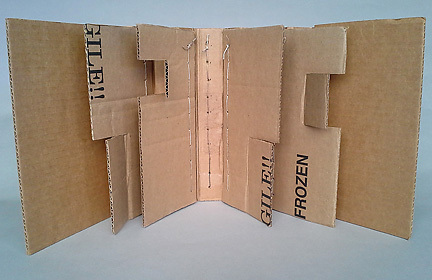 “Windows and doors” are cut into the planes of the corrugated cardboard surface, creating more moment and views. The parts are stitched / lashed together with hemp chord. The piece is designed to draw attention to the parallels between books and architectural spaces, and explore the connections between them. I hope you enjoyed this Book eSCAPE, and join me again to travel between the covers and through the sheets…of cardboard and paper of course.